The Euro-Mediterranean Human Rights Monitor has been accredited by the International Youth Federation (IYF) for its youth-centered projects and human rights work across the MENA region and Europe, providing advocacy, support and guidance to youth. 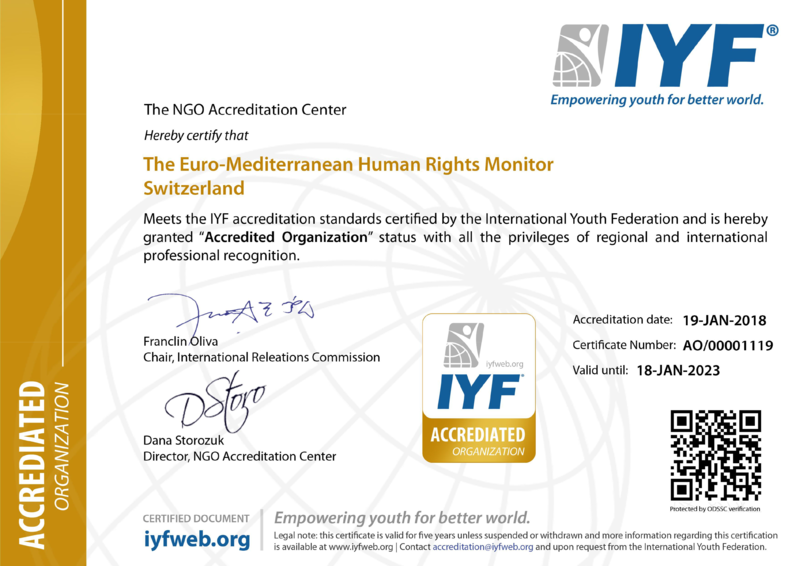 "The accreditation status clearly reflects Euro-Med Monitor's solid commitment and team's dedication to supporting youth empowerment to achieve sustainable, better and empowered youth by 2030," says IYF. Euro-Med Monitor has formed partnerships with many human rights groups, universities and legal centers, and has been able to achieve well-earned successes in many projects aimed particularly at youth development and empowerment of women as well. Such projects include We Are Not Numbers, a storytelling platform for refugee youth in the Palestinian territories and Lebanon; Training-Mentorship-Production, a youth employment project for university students and recent graduates in the field of human rights; Women Leadership Incubator, a project for women empowerment in marginal areas; Summer School on Armed Conflict and Human Rights, a project that provides theoretical and practical training in IHL concepts, moot trials, and concepts of occupation and internal armed conflict, among others. The Fédération Internationale de la Jeunesse, in English International Youth Federation (IYF), is an international non-profit youth organizations network governed by the present Statutes and the Swiss Civil Code. It is neutral politically, and non-denominational, aims to empower youth worldwide. The IYF is a part of the United Nations Sustainable Development Solutions Youth Network. The Euro-Mediterranean Human Rights Monitor is an independent Geneva-based nonprofit organization, with regional offices and representatives in different countries that documents human rights violations across the MENA region and Europe, with a special focus on refugees and armed conflicts.